[S257] Marriage Volume 1, page 140, Weidner - Teigh, 24 May 1920, Church of the Incarnation, Minneapolis: entry for Weidner - Teigh, 24 May 1920 Church of the Incarnation, Minneapolis, Hennepin County, Minnesota, USA. [S848] Dolores Mary Snider, Minnesota Department of Health; Section of Vital Statistics; Certificate of Death. [S244] Ralph L. Weidner entry, Certificate of Birth 207, Birth year extracted from age at last birthday on Ralph's birth certificate. Also shows birth location. (12 May 1928). [S432] Leander A. Weidner, Minnesota Department of Health; Section of Vital Statistics; Certificate of Death, date and state of birth only. 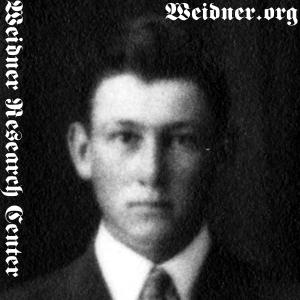 [S511] Leander Andrew Weidner, Birth Certificate not stated, date and location (25 Jan 1900). [S640] Bernice Pauline Weidner, State of Minnesota; Division of Vital Statistics; Certificate of Death. [S1331] Daily Times, St. Cloud, 14 Apr 1988, p. 5B, col. 2, Death year only.